High Heat (Heat Stabilized) Glass Reinforced Polyamide 66 Market size will likely surpass USD 4.6 billion by 2025; according to a new research report by Global Market Insights, Inc.
High heat (heat stabilized) glass reinforced polyamide 66 market is most likely to witness growth in the forecast timeframe due to the developments in the electronic industry. The superior properties of the product like flame retardant characteristics, good di-electric strength, and insulation resistance makes it an ideal fit for electrical appliances. high heat (heat stabilized) glass reinforced polyamide 66 is widely used in the production of motherboard of computers, power tool housing, connectors in mobile phones, terminal blocks, circuit breakers, connectors etc. 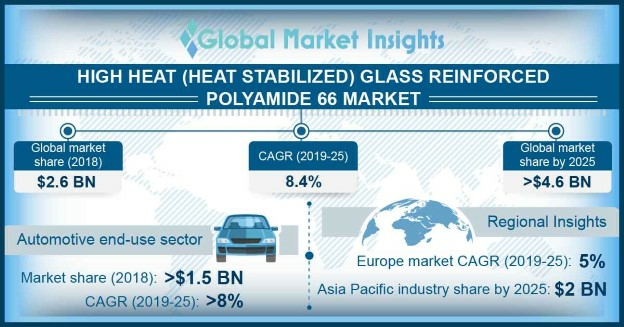 Strict regulations governing the polymer industry would restrict the growth of heat stabilized glass reinforced polyamide 66 market in the forecast timeframe. Many regulations regarding plastic production, usage and disposal have been implemented to cut down the negative impact on the ecosystem. These regulations could hinder the market growth, especially in developed regions in the coming years. Virgin grade is a key raw material segment of the high heat (heat stabilized) glass reinforced polyamide 66 market. This segment provides superior performance compared to recycled grades and products made from this raw material is majorly used in critical areas. This segment is likely to achieve a CAGR around 6% in terms of volume in the forecast timeframe. Product with 21% – 33% reinforcement is a key product type in the market. It delivers the highest performance to cost ratio with superior mechanical and thermal properties. This segment is likely to generate revenue exceeding USD 2 billion by 2025. Most of the automotive components made from the product have glass fiber concentration close to 30%. Higher glass fiber concentration increases the abrasiveness of the component which may damage the metal parts it is connected to. Automotive is a key segment in the heat stabilized glass reinforced polyamide 66 market as the product is used to make various under the hood components such as gears, engines, radiator tank parts, oil filters, etc. The hygroscopic property of the product allows its usage in the presence of water or moisture, such as in radiator tanks where the water temperature crosses 150 C and the ambient air is as hot as 180 – 200 C. This segment is likely to achieve a CAGR of 8% by 2025. Asia Pacific high heat glass reinforced polyamide 66 market value is likely to reach around USD 2 billion by 2025. Increasing demand from countries like China, India, Japan and South Korea would significantly spur the market growth in the forecast timeframe. China being one of the largest producers of automotive in the world, occupies a significant share in the market. South Korea is another significant market due to high production of electronic products in this region. Some of the key product manufacturing companies in the high heat (heat stabilized) glass reinforced polyamide 66 market include BASF, PolyOne, Sabic, Ascend Performance Materials Dow Dupont Inc., etc.